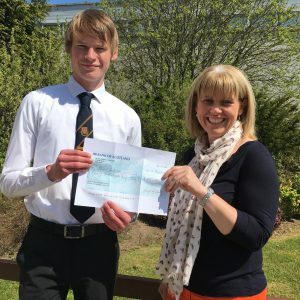 Stuart receives his prize cheque from Mackie Academy head, Louise Moir. Photo by Lynda Swanson. We ran our first competition for Advanced Higher Modern Studies students this spring with this challenge. The winning entry by Jodie White of Edinburgh will appear in our June issue: Stuart Anderson and Beth Moran were runners-up and their entries are appearing on this blog. Stuart Anderson has been a student at Mackie Academy, Stonehaven and hopes to move on to the University of Edinburgh to read Law and Economics. He hopes to be a lawyer and is already making a name for advocacy, having led his school team in the Bar Mock Trial competition run by the Citizenship Foundation The team are reigning Scottish Mock Trial champions and secured third place in the UK finals held recently at the Old Bailey in London. Scotland is on its way to creating a fairer, safer society. However, there is still a long way to go. The Scottish court system is one of the fairest in the world, but there are still some issues that arise primarily in sentencing and in regard to the right to a fair trial. Before a trial takes place, the jury should be unaware of the content of a trial and should be oblivious to the ins and outs of a case. The jury should reach their decisions based solely on the evidence that they have heard in court. Yet, in 2016 this may be an impossible task, especially cases that are high profile in their nature. In the modern world, the traditional forms of media are in decline and more contemporary types are on the rise. In a survey carried out, 90% of people admit to having social media and 74% of those stated that they use it more than once per day. Social media and the internet is clearly now used by the vast majority of the population. On the internet it is possible for a juror to see things about their case, either accidently or intentionally, without anyone knowing. Take the case of the tragic stabbing an Aberdeen school last year. Within hours of the incident, a social media storm was brewing, with the case drawing its own “hashtag” and trending on Twitter. Very quickly, every person in Aberdeenshire was aware of what was going on and given the rarity of such an event, were taking a keen interest as it unfolded. A problem is presented here for the justice system because by subsequently holding the trial in Aberdeen, finding jurors with no prior knowledge of the case would have been nigh-on impossible as it would have been all over their social circles at the time it took place. Therefore, in a local area social media makes the right to a fair trial very difficult. An issue which is currently being addressed is that of ineffective short sentences. Continuing to address this significant problem is of great importance in order to improve our country. Scotland currently has one of the highest rates of imprisonment in Europe which costs the state hugely. Much of the prison population consists of those on short term prison sentences which prove to be extremely ineffective and are out favour from experts. The reoffending rate in our country must be tackled and short sentences are not the way to do that. They effect people’s life hugely and can make it far harder to turn their life around. Short sentences interrupt employment, housing and family relationships making it much harder for a get their life back on track. Furthermore short sentences are not long enough for the prison staff to have an impact on the offender and are ineffective. To solve this expensive problem alternatives to prison must be looked in to further. Community disposals must be researched further and tested to see which alternatives will suit Scottish society and prove to be most effective. Ideally it would be beneficial if sentences were properly tailored to each individual case in order for them to be effective. Alternatives such as drug treatment and testing orders would be beneficial in helping those with serious drug problems which lead them to crime in the first place. Each individual case is different and so each sentence should be different too. There must also be attempt to change society’s attitude towards sentencing and prisons. The Scottish Sentencing Council is a step in the right direction in terms of this and educating the public about sentencing, however, more must be done. Currently the public like the idea of prison and harsh punishment but they must be educated about rehabilitative processes which are proving to more effective. Society’s attitude is far different in Norway where reoffending rates are much lower and where rehabilitative processes are pioneering the way for other countries. Scotland should not only be open to looking to other countries and adopting methods that work but should also be the ones pioneering new techniques for others to look to. By tackling the key problems stated above Scotland would become a much safer and fairer place to live. The Scottish Justice system exhibits excellent practice on a daily basis, however, if the things outlined above were focused on in the next parliament, it would become even fairer and more effective. 1 Pings/Trackbacks for "Letters to the Cabinet Secretary for Justice"